The Croatian Minister of Culture, Mr. Zlatko Hasanbegovic unambiguously glorified the Ustasha movement and advocated the establishment of the Greater Croatia in the magazine ‘The Independent State of Croatia’ published during the 1990s. He was photographed with Mladen Schwartz, Velimir Bujanec, and the son-in-law of Ante Pavelic. In one of the photographs he even wears an Ustasha cap. The then editor-in-chief of the ‘Independent State of Croatia’ (‘NDH’) monthly was Srecko Psenicnik, the son-in-law of Ante Pavelic and the President of the Croatian Liberation Movement (HOP), a pro-Ustasha party founded by Pavelic, the leader of the Croatian Ustasha movement during the Second World War. 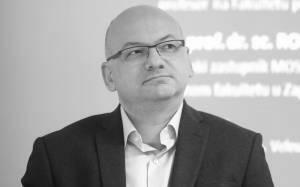 In 1996, Hasanbegovic wrote at least two articles for the monthly which propagated the work and the political ideas of Ante Pavelic and systematically denied the crimes committed by the fascist Independent State of Croatia. As a history student at the Faculty of Social Sciences and Humanities, Hasanbegovic wrote about the history of Muslims in Croatia, emphasizing their political and social renaissance during the political reign of Ante Pavelic. In a short commentary, illustrated by a photograph of a ceremonial opening of the Mosque in Zagreb featuring Pavelic in the company of Muslim dignitaries from the Ustasha movement, Hasanbegovic criticized a policy of partitioning of Bosnia and Herzegovina. He accused the advocates of such policy of ‘abusing the honorable symbols and names of Ustasha heroes whose bones of martyrs and shaheeds are now turning in their graves from shame and misery inflicted upon them fifty years later by their so-called followers’. As an alternative to those fake followers, Hasanbegovic offers authentic followers of Ante Starcevic and Ustasha ‘heroes and martyrs’ who, like the author himself, are driven by a desire of creating a Greater Croatia, as envisioned by Pavelic. 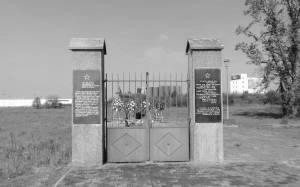 ‘Precisely in the name of those true heroes, martyrs and shaheeds who gave their lives for our Homeland, from the fields of Bleiburg to Foca and Fazlagic Tower, we, the true Croatian nationalists and followers of Starcevic, the deceived and defeated Muslims and Catholics, should expose those hypocrites and moral freaks for who they really are, and show the people the way out of this dark tunnel towards peace and unity and religious tolerance which can only happen in a truly free and unified Homeland stretching from Mura, Drava and Drina rivers to the Adriatic Sea’, wrote Hasanbegovic. The present Minister is listed as an associate writer for the ‘NDH’ publication from April to November 1996, but is featured as an author already in the February edition of ‘NDH’ as well as in the first edition printed in Croatia after being issued abroad for many years. Psenicnik, a political immigrant and the president of HOP party managed to transfer the publication of the ‘NDH’ monthly from Canada to Croatia, and even successfully registered the HOP as a legitimate political party in Croatia, despite their political platform affiliating them to the Ustasha movement and to the acts of terrorism. The party is still active in Croatia and it still promotes the political agenda of Ante Pavelic. Its activity is not substantial, but according to the latest available data it has 650 members. In his most recent public appearances, Hasanbegovic has tried to deny his previous political involvement with HOP. However, in one of the photographs featured in ‘NDH’ monthly, he is described as a ‘young HOP member’. In other photographs of Hasanbegovic, he is described as a member of a party called the Young Croatian Rightists, headed at the time by Velimir Bujanec. Ha was also photographed in the company of Mladen Schwatrz, a right-wing political activist who during the 1990es advocated the establishment of a fascist regime in Croatia. Regardless of the formal and legal nature of his connections to Pavelic’s and Bujanec’s radical parties, the fact remains that Hasanbegovic had intensive social contacts with some of their most prominent members and attended events organized by the radical right. The photographs featured in the monthly corroborate this. They show Hasanbegovic protesting against the Dayton Agreement, participating in the Bleiburg commemoration, and posing on the Split promenade wearing an Ustasha cap. In Bleiburg he was photographed with the representatives of HOP and with Pavelic’s son-in-law Srecko Psenicnik, the author of the text accompanying the photographs. In a report from Bleiburg, illustrated by this and other photos with numerous Ustasha insignia, Psenicnik is openly glorifying the Ustasha movement. In Split, Hasanbegovic poses with five young men all described as ‘young nationalist’ in the caption. Among them is Bujanec, who in the featured interview proclaims: ‘The future is ours’, just before the parliamentary elections in October 1995. 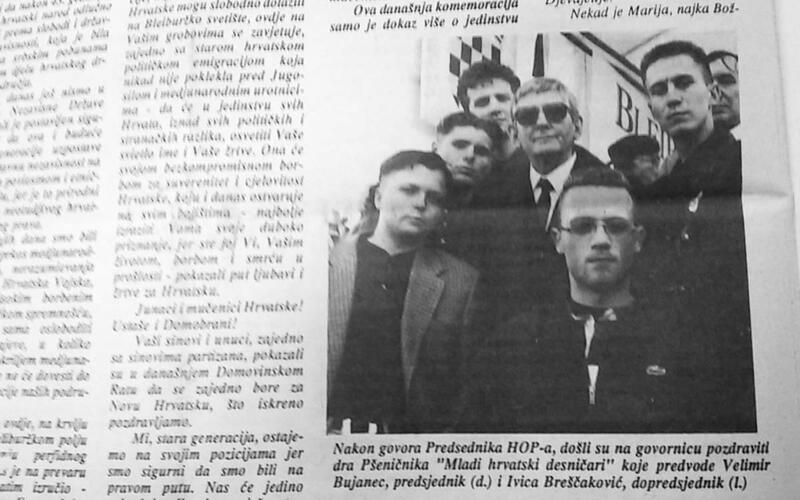 In all three photos, Hasanbegovic is in the company of Bujanec, a man who will later become a member of the HOP youth fraction, a board representative of the ‘NDH’ magazine and their public relations officer. At that time Bujanec, who is now the host of the TV show Bujica, was one of the many members of the Croatian Party of Right (HSP) and of the Young Croatian Rightists, who subsequently joined HOP. Pavelic’s son-in-law Srecko Psenicnik wrote in ‘NDH’ that there were many reasons for their massive transfer to HOP, but the key reason was their dissatisfaction with the fact that Pavelic’s photos were removed from all the HSP offices. 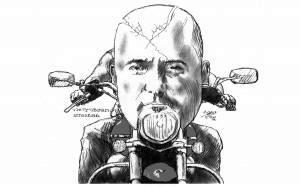 Later on Bujanec tried to distance himself from his own neo-fascist past, especially the part related to the ‘NDH’ monthly. His fellow comrade at the time, the present Minister of Culture, later became a frequent guest in his TV show ‘Bujica’. As a guest of the ‘Bujica’ show in 2015 Minister Hasanbegovic stated that the Government should stop sponsoring the Jasenovac commemoration because it does not serve to commemorate the victims, but to rehabilitate Yugoslav communism. In 1996, Hasanbegovic was elected the president of the youth fraction of the Croatian Pure Party of Right (HCSP) and remained at that position until the end of 1997. In an article featured on the HCSP’s official website it is claimed that the organization gained additional strength and membership precisely during Hasanbegovic’s tenure. The party was at the time led by the politician Ivan Gabelica, who, after winning a seat in the Parliament, left the HSP and reactivated his HCSP membership. Gabelica dedicated many years of his political work to the rehabilitation of the Ustasha movement, claiming that the negative interpretation of the Ustasha movement should be viewed in light of the Yugoslav-Communist historiography. His ideological habitus is well illustrated by the fact that Mladen Schwartz and Psenicnik considered him the only person worthy of leading the unification of all the existing parties based on the teachings of Starcevic. HCSP shared Gabelica’s ideological views. During the 1990s, HCSP and HOP organized Catholic masses commemorating Ante Pavelic and to this day they remain regular visitors to such masses that annually take place in the center of the Croatian capital. 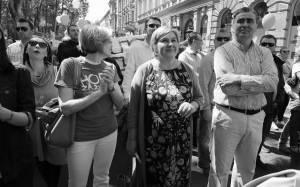 They have regularly participated in the demonstrations against Gay Pride, as well as those against non-governmental organizations which demanded that a square in the center of Zagreb be returned its past name, the Square of the Victims of Fascism. Their inclination towards the idea of NDH has been expressed on many other occasions, be it through the use of the ‘Za dom spremni’ Ustasha salute, their cooperation with the neo-nazi groups such as the Hungarian Jobbik, or more recently through promotional videos on YouTube in which they attract new members with propaganda posters from the NDH era. The recently appointed minister of culture spent a considerable part of his political life in extremist political organizations and has never distanced himself from this past. 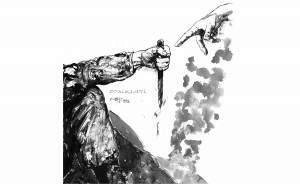 Instead, he has directed his efforts towards denying the claims that his statements represent relativization of the WWII events, emphasizing that all of his statements were taken out of context. The context, however, is that Hasanbegovic was a contributor to the monthly magazine called ‘Independent State of Croatia’, that he glorified the Ustasha movement under the editorial authority of Ante Pavelic’s son-in-law, that he called the Ustashas ‘heroes and martyrs’, and that he posed wearing an Ustasha cap. When recently asked about the controversies regarding minister Hasanbegovic, the Prime Minister Tihomir Oreskovic stated that Hasanbegovic is an anti-fascist. He reiterated this statement more recently when he said to the media that Hasanbegović is in fact a ‘convinced antifascist’. After these most recent revelations, we are eager to hear once again what the Prime Minister has to say.